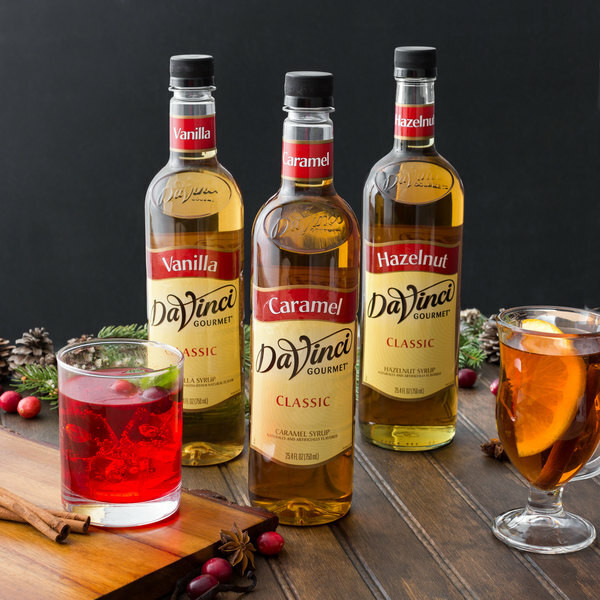 Choose from over 60 classic flavors, and discover the rich taste and quality consistency in each and every DaVinci Gourmet product, including this caramel flavoring syrup! 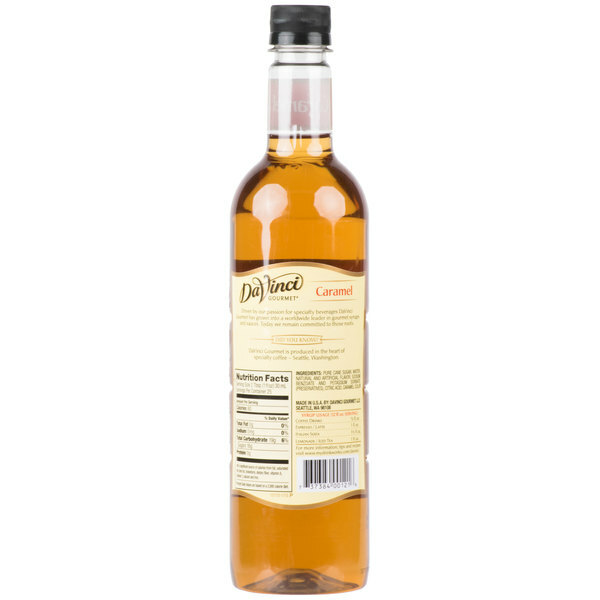 DaVinci Gourmet flavoring syrups are made from pure cane sugar to complement your beverages without overpowering them or being too sweet. They are specially formulated to hold up well under heat, making them the perfect choice for espresso-based drinks, brewed coffee or tea, and more. Since caramel is a versatile, popular flavor, it can be used in many hot, cold, or blended drinks. Mix it into milkshakes, iced lattes, and other coffee shop favorites. You can even use it with baking ingredients to quickly and easily enhance your dessert recipes. One splash of flavoring syrup goes a long way, and flavored beverages enhance your menu with new, appealing items. This user-friendly plastic bottle is easy for your baristas and restaurant staff to handle. 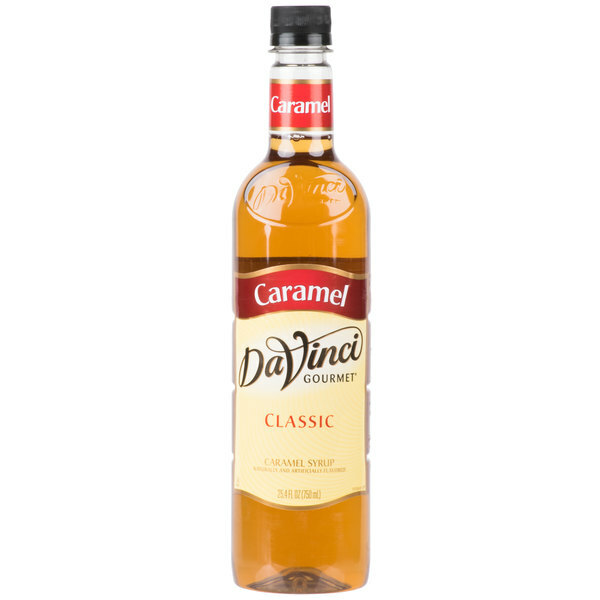 Sold in gourmet coffee shops, specialty food stores, food service outlets, and grocery stores, DaVinci Gourmet products, like this caramel syrup, have a long history of commitment to quality and superior taste. The is the best caramel flavor for coffee. I put two pumps in my ice coffee and it is so good. I like to do the caramel drizzle on the side of the cups for looks but it doesn't give it enough caramel flavor so I like adding the pumps. This syrup is used to flavor hot and iced lattes and it complements the espresso and milk perfectly. As always we recommend the DaVinci brand. DaVinci is my favorite brand of syrups! I use the caramel flavor for many of my baked recipes. It is great in coffee too! I have one at the coffee station with the pump and one in my cabinet for my baking. Great Product from Davinci Gourmet. If you’re looking for a good Caramel Syrup for flavoring drinks this is definitely the product to use. Would reccomend for any food establishment that offers coffee drinks. We love this caramel syrup for our coffees and lattes. Mixes in well and gives a strong and smooth caramel taste. No aftertaste just sweet goodness. A delicious classic caramel syrup that is bold and buttery. The best way to make a wonderful tasting caramel latte. The syrup is a wonderful price. This is a great product. It has a rich caramel flavor that tastes delicious in the specialty coffees, Webstaurant had the best deal on the product and fast shipping. Would order again. One of our most used flavorings for custom lattes and coffee drinks. Our customers seem to like it and are always commenting on how good the flavor is. I now buy this exact syrup on this website only because when I shop at my local stores, it is so expensive. I am so glad that it is so cheap here because this is a great syrup. I love the old fashioned taste of this classic caramel flavoring syrup. It is great to add to coca cola for an old fashioned caramel cola drink. So rich and buttery. A nice classic style caramel syrup that is our favorite syrup for making cappuccinos. The caramel flavor is great and very bold. The whole package is great from taste to bottling. 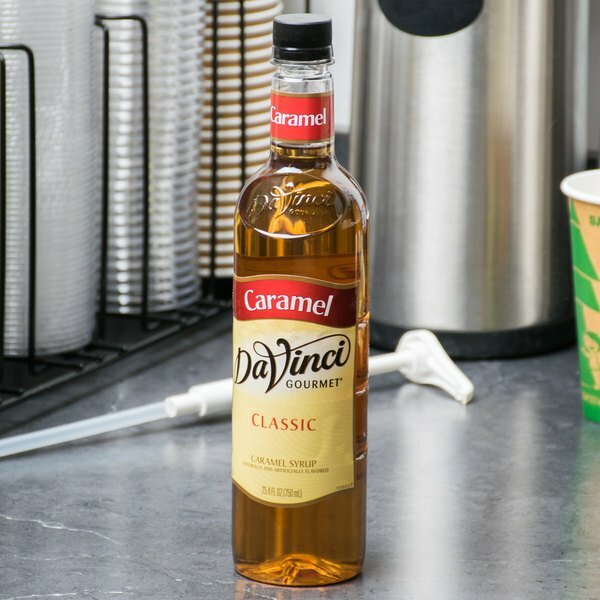 The classic caramel flavoring syrup is rich and creamy and perfect for making a caramel macchiato. The caramel flavor is superb and one of my favorites.